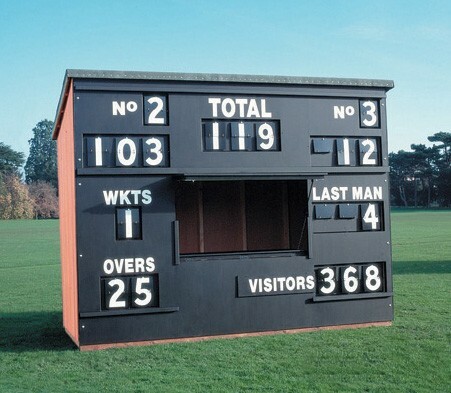 Excellent quality cricket scorebox. The scorefascia is smooth exterior fibreboard finished matt black with all telegraph numbers attached to swivel boards for internal operation. Clad in attractive cedar matchboarding finished with preservative, the scorebox has a two-scorer hatch, which splits outwards to form an awning and inwards to make a scorers' desk. The mono-pitched roof is covered with flowcoat fibreglass and the floor is strong timber. 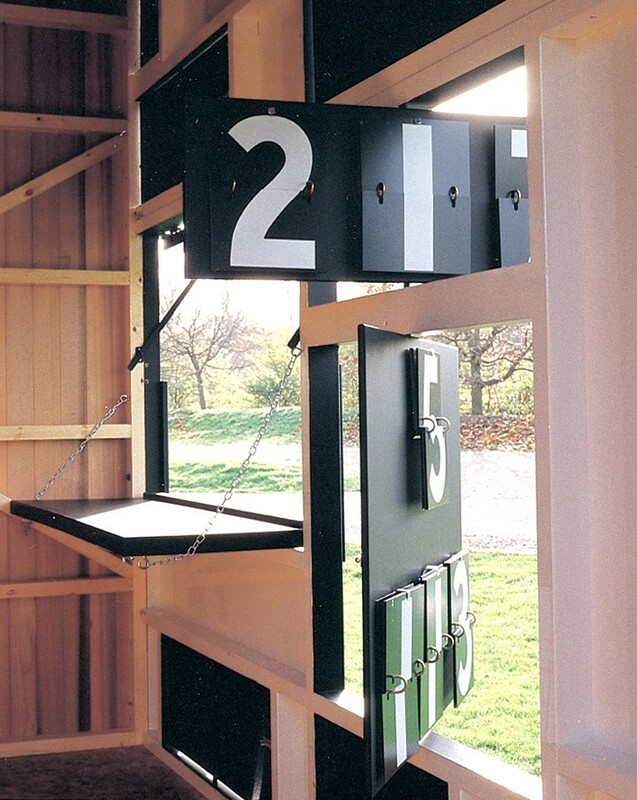 Timber security shutters cover the numbers when not in use. Information shown consists of Total, Overs, Wkts, Batsmen's Numbers and Scores, Last Man and Home/Visitors. Dimensions: 3.36m long x 1.73m deep x 2.74m high at the front and 2.44m high at the back. Door at one end. Optional Extra: Mechanical Scorer Units can be incorporated into the scoring system. Normally these are situated in the fast moving numbers, such as the tens and units of the total and batsmen's scores. Please note: These scoreboxes should normally be fixed down to a prepared ground base. Where this is not possible you can purchase a set of scorebox wheels as an optional extra. Wheels must be ordered at the same time as the scorebox.